Scientists exploring the origins of the universe have photographed a cluster of galaxies six billion light years away – and the result is more than a little mind-bending. 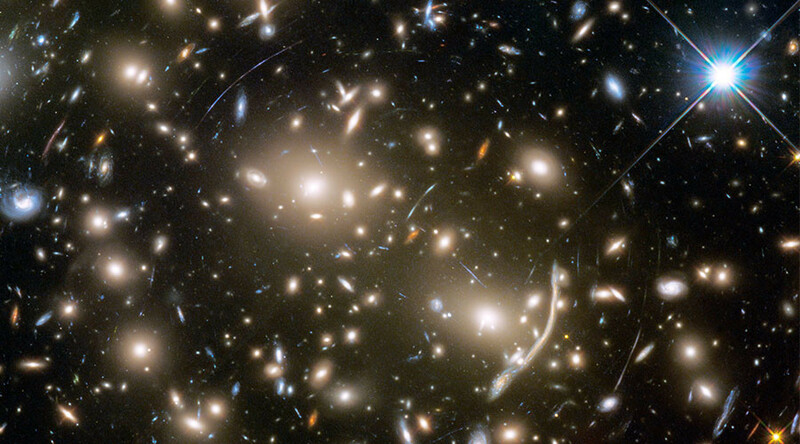 Researchers working on Frontier Fields, a project aimed at gathering the earliest images of the cosmos, have used the Hubble telescope to capture images of Abell 370 and the distant field of galaxies behind it. Hubble’s picture, which is reminiscent of a beautiful piece of modern art, shows mysterious arcs of blue light bending around hundreds of yellow-white and elliptical galaxies. These arcs are the result of a phenomenon known as 'gravitational lensing', when the collective gravity of the hundreds of billions of stars warps space. The warping bends the light traveling through the cluster and drags it toward Earth. Abell 370 is found in the constellation Cetus, commonly known as the Sea Monster. Light from far flung galaxies takes billions of years to reach Earth, meaning Hubble’s pictures are in fact images of the distant past. Albert Einstein first predicted in 1912 that the gravity of large objects could bend light. Later, in 1937, astronomer Fritz Zwicky suggested the phenomenon would eventually be a means for scientists to view galaxies hidden behind massive clusters. The Hubble telescope, which celebrated the 27th anniversary of its launch last month, has been used to unlock the mysteries of the universe and, in recent times, has aided in the search for other Earth-like planets beyond our solar system.